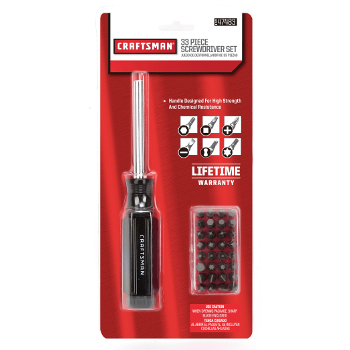 This 32 piece Craftsman screwdriver set is perfect for all of your work with security and specialty fastener needs. The alloy-steel blade is heat treated to ensure strength and is plated with a Chrome finish to ensure a corrosion resistant tool. The Chemical-resistant butyrate handle provides comfort which allows for the highest torque capabilities. 1 - 1/4” sq. drive to 1/4” Hex Adapter.